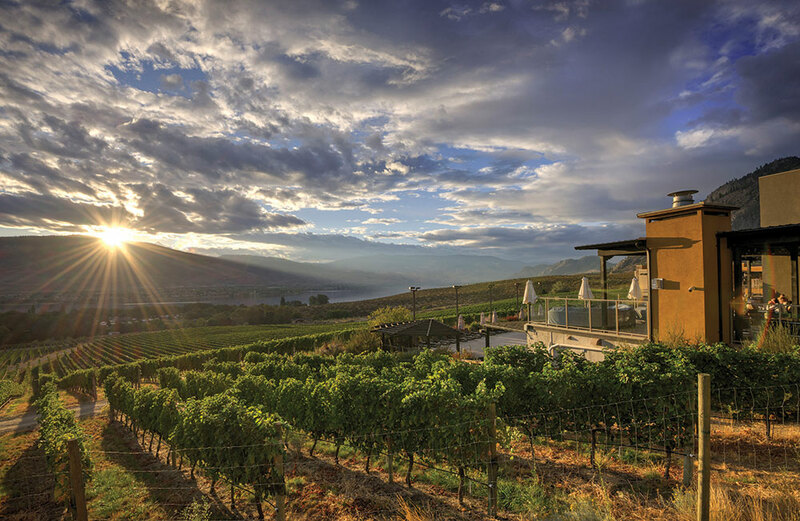 As dawn breaks, the sun crests over a nearby mountain range, casting a warm glow down the valley and over the lush vineyards at the base of Spirit Ridge, a luxury resort in Osoyoos at the southern tip of the Okanagan Valley. Standing in a circle on a small hill, we are welcomed to this majestic place by the sounds of a young man singing a ceremonial song to the beat of his drum. Dyawen Louis, a cultural centre interpreter, begins the smudging ceremony by gently wafting a smoking bundle of sage, sweetgrass and cedar over us. Home to the Osoyoos Indian Band (OIB) for thousands of years, we reflect on the land’s storied past and the generations of people who have walked this path before us. Looking out over the rugged desert and fragrant lavender and sage bushes, I had to remind myself I was in Canada and not California or Arizona. After flying from Ottawa to Kelowna, I travelled by private car for the 125-kilometre journey south to Osoyoos, marvelling at the changing landscape and passing rows of fertile vineyards, fruit orchards bursting with life and colourful roadside stands selling fresh produce, honey and jams. From mountains to shore, the diverse landscape—a desert oasis that boasts more sunny days than anywhere in Canada—is an ideal backdrop for a variety of all-season sporting and cultural activities. The big draw, of course, is the vineyards, countless wine tours and authentic cuisine. Thanks to an ideal microclimate and a variety of soil conditions, dedicated grape-growing farmers and knowledgeable winemakers produce something for every palate—from big, bold reds and rich Syrahs (a.k.a. Shiraz) to crisp whites, sweet ice wines, vibrant rosés and sparkling wines. I’d been invited with other travel writers to sample the wine, eat well and relax in the very heart of the region’s rich Indigenous history. Striking outdoor metal art by Smoker Marchand can be found throughout the property at Spirit Ridge, including one of an Indigenous man on horseback, at the entrance to the Nk’Mip Desert Cultural Centre. Driving up to Spirit Ridge, I was impressed that the charming adobe-style buildings blended in perfectly with the rustic setting. Purchased by the Unbound Collection by Hyatt in 2017, Spirit Ridge, which sits on OIB land, is situated on the foothills of Anarchist Mountain and is surrounded by unspoiled beauty. Striking Indigenous art, wooden totem poles and steel sculptures of sacred animals greet visitors at every turn, reminding us of the real guardians of this land. After checking in, I entered my spacious two-bedroom condo with full kitchen, two bathrooms and laundry facilities and was greeted with a bottle of rosé from the nearby Nk’Mip Cellars. Pouring a glass, I sat on my cozy patio overlooking the vineyard before eventually setting out to roam the property, which boasts 226 villas, condos and suites grouped by names such as Riesling, Chardonnay, Pinot, Shiraz and Cabernet. 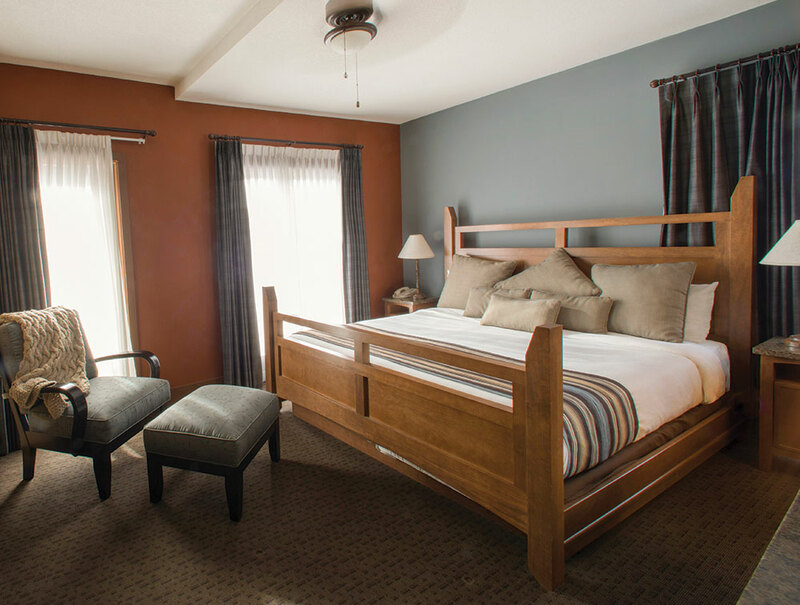 The pace at this destination resort is leisurely, offering guests every opportunity to unwind. Whether you’re going for a girls’ getaway, family vacation, wedding or corporate event, Spirit Ridge caters to the modern traveller seeking a unique experience while also enjoying deluxe amenities, including two swimming pools and hot tubs, a steam room, fitness centre, cabana rentals and the impeccably manicured nine-hole golf course, Sonora Dunes. The comfortable Mica restaurant is big on flavour, supporting local, and pleasing any appetite, while The Market is ideal for coffee-on-the-go, fruit juices and salads. Located just a few steps away from the hotel’s main lobby is Nk’Mip Cellars Winery (pronounced in-ka-meep), an award-winning winery and vineyard owned by the OIB, which offers year-round wine tastings and tours, a wine shop and restaurant with a patio overlooking the sparkling waters of Osoyoos Lake. Whether you’re going for a girls’ getaway, family vacation, wedding or corporate event, Spirit Ridge caters to the modern traveller seeking a unique experience while also enjoying deluxe accommodations and amenities, including two swimming pools and hot tubs, a steam room, fitness centre and an impeccably manicured golf course, Sonora Dunes. 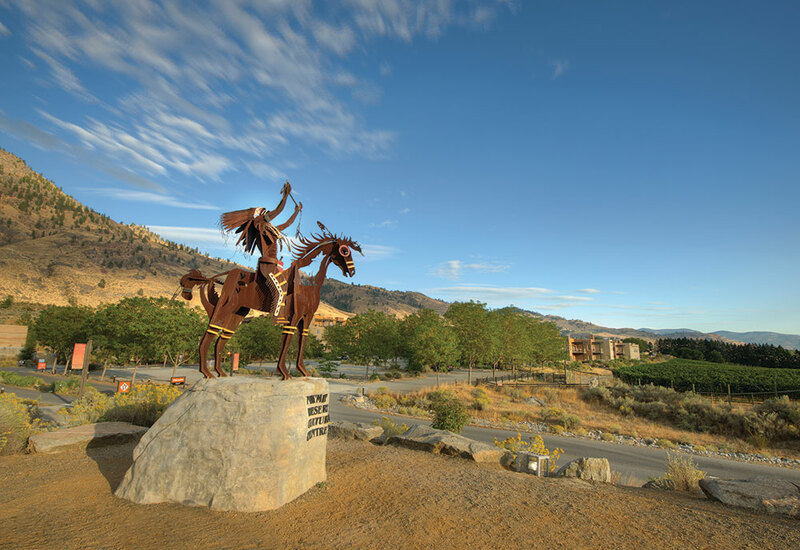 The nearby Nk’Mip Desert Cultural Centre, a state-of-the-art interpretative centre with replica teepee village, is a must-visit and features hands-on exhibits, a cultural history of the Osoyoos people and a network of nature trails. Over the next two days, we enjoyed guided tours of several wineries (listed below) and fabulous wine-and-food pairings, drove to the top of Anarchist Mountain, picked strawberries at the delightful Covert Farms and took a short walk to Spotted Lake, a site revered by Syilx (Okanagan) First Nations, which is rich in minerals and salt deposits that form large rings or spots of colour in blue, green and yellow, when the lake water evaporates in the summer heat. On numerous occasions during our travels, we found ourselves in the town of Oliver. Often referred to as Canada’s wine capital, it produces more than 17,000 tonnes of grapes and 12 million bottles of wine per year, and it has a strong reputation for its farm-to-table cuisine and eateries, bakeries and top-notch cheesemakers. To relax from all the wine tasting, I headed for some pampering at Spirit Ridge’s Solterra Desert Spa and enjoyed the desert stone massage. The relaxing spa offers an array of services, including body wraps, facials, scrubs and treatments for couples. To toast the day, my fellow writers gathered at Mica restaurant (micarestaurant.ca), where we sat on comfy couches on the terrace enjoying sparkling wine and a mouth-watering meal, which included beef short ribs, wild B.C. salmon and lemon risotto. The trip literally ended on a high note as four of us were whisked by helicopter by the Okanagan Mountain Helicopter Company from Spirit Ridge to the Kelowna International Airport. We soared over the vineyards, mountains, lakes, rivers and towns and some of the very roads we had recently travelled. Our expert pilot eased our initial jitters by entertaining us with stories and pointing out noteworthy landmarks. It was an exhilarating experience and a marvellous way to wrap up such a memorable trip. The tag line of the Unbound Collection by Hyatt is the promise of a story-worthy experience. Mission accomplished: Every sip, sight and story was special. Visit spiritridge.hyatt.com for more information. 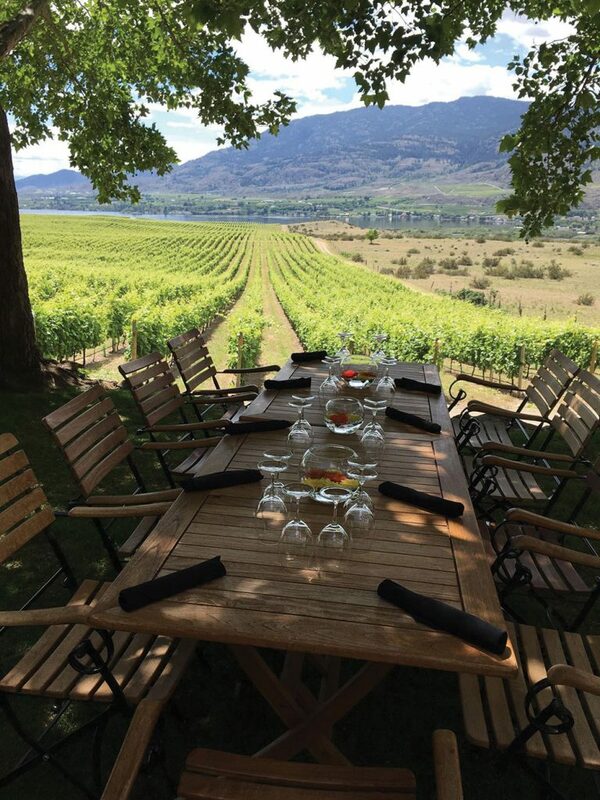 The table is set at Spirit Ridge, for a sublime getaway in the warm Okanagan sun. 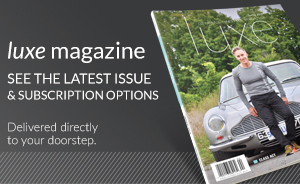 You could spend weeks visiting the numerous wineries and eateries in South Okanagan. Here is a roundup of places we visited during our stay. As celebrated chef Chris Van Hooydonk, the lively owner of Backyard Farm Chef’s Table, and his two sous-chefs prepared one of the most memorable meals I’ve ever had, we watched as they worked their magic in perfect unison from an open kitchen a few steps away from the cozy farmhouse-style dining room. Inspired by an old-world approach to eating, menus are developed exclusively by Chris, who embraces healthy eating, a sustainable approach to food and a strong emphasis on supporting local farmers and producers. He is a master storyteller and enjoys “breaking bread” with guests, while offering a detailed account of each course. The picturesque venue, located next to his family home, boasts more than 100 fruit trees, several beehives, a chicken coop and large vegetable garden. It is so popular that you need to book well in advance. Throughout our meal, we enjoyed wine from Nighthawk Vineyards, owned by Spirit Ridge’s general manager Daniel Bibby. Located at the gateway to the iconic McIntyre Bluff, a ridge of rock that resembles the carved face of a person, we toured this impressive Covert family property in a bright red, vintage 1952 Mercury pickup—a definite highlight of the trip—while learning about organic growing practices and the effort and care they require. The 263-hectare organic farm, vineyard and winery, which also has paddocks of alpacas and Highland cattle, is an ideal place to spend a few hours. During our visit, we spent time picking juicy strawberries—they grow more than 40 organic vegetables and fruits—and enjoyed a sampling of wine and small bites in the tasting shop and wine lounge. Established in 2002 and overlooking Osoyoos Lake in the Okanagan Valley, this celebrated winery is the first Aboriginal-owned and operated winery in North America. Its grapes are sourced from the Osoyoos Indian Band’s vineyard. We enjoyed a delightful private meal prepared by winery chef Orlin Godfrey in the wine-cellar vault, which featured a bounty of locally sourced produce served with Nk’Mip’s award-winning wines. Courses included grilled local asparagus and balsamic reduction paired with the 2016 White Meritage Mer’r’iym, roasted beet salad with 2017 Rosé, pan-seared Haida Gwaii Coho salmon and grilled king oyster mushrooms with 2015 pinot noir and a cheese plate with their Riesling Ice Wine. The Dhaliwal brothers and their family own Kismet, which means destiny or fate, an aptly named winery in Oliver, B.C. After immigrating to Canada from India in the 1990s, they initially worked as labourers; then they began purchasing land and gained recognition for growing grapes for other wineries throughout South Okanagan. Launching their own 350-acre winery in 2013, they named several wines for the spiritual law of destiny: Karma, Mantra and Moksha. 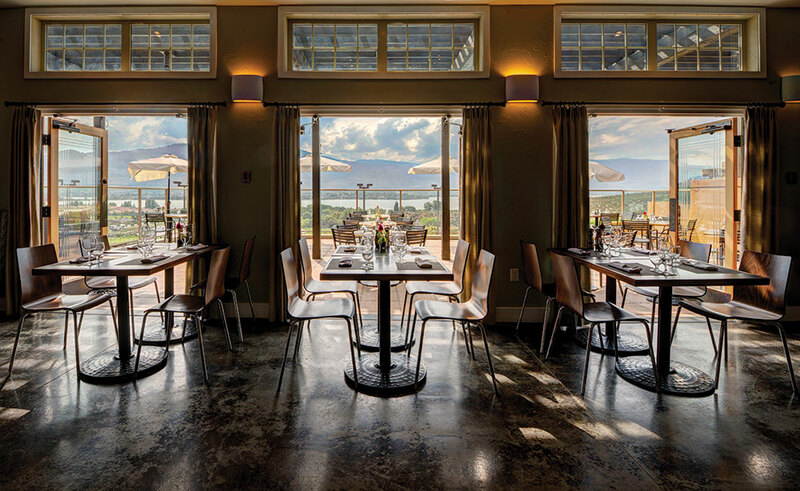 We enjoyed a flavourful Indian lunch on a large patio at the winery’s Masala Bistro, which is nestled amid the vineyard. Life doesn’t get better than this: Sheltered by a canopy of mature trees, looking out over rows of vineyards, a river and mountain, a wine-and-food tasting at SunRock Vineyards should not be missed. Photo: Janet Wilson. Perched on the SunRock Mountain slope in sundrenched Okanagan Valley, the 73-hectare vineyard, which was established in 1999, produces rich, complex wines with vibrant fruit flavours, which are balanced with a touch of acidity. Our tour wound its way through the pretty vineyard, arriving at an outdoor gazebo shaded by a canopy of leafy mature trees. Our entertaining host, Steve Ward, enlightened us on the basic rules of food-and-wine pairing as we sipped and sampled wine from SunRock and Jackson-Triggs, a pioneer in B.C.’s wine industry, while soaking up the atmosphere and surroundings.